It's rare to get the opportunity to sample a beer from another state that isn't distributed here in Colorado. 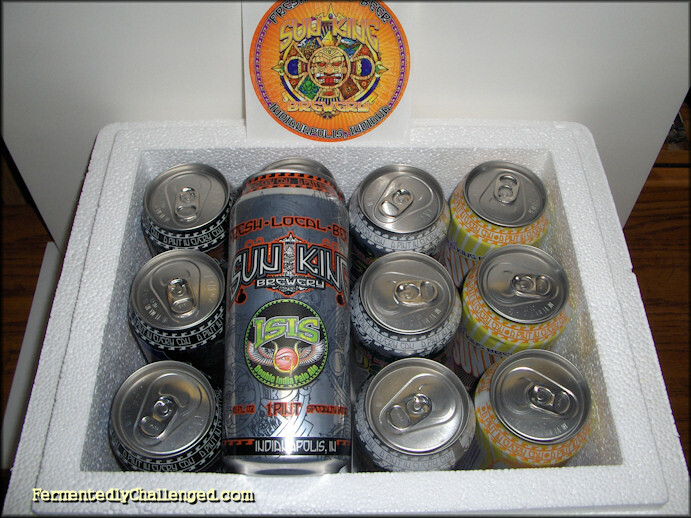 Sun King Brewing Company of Indianapolis, IN was generous enough to send me several samples recently for me to try. Knowing that this brewery took home a couple handfuls of medals at the 2011 GABF made me want to try their beers even more. It's ironic that when I volunteered as a beer pourer at the 2011 GABF that I worked right next to their booth during one session and had only sampled one of their beers. Now comes a fairly recent beer that is one of Sun King's biggest beers. 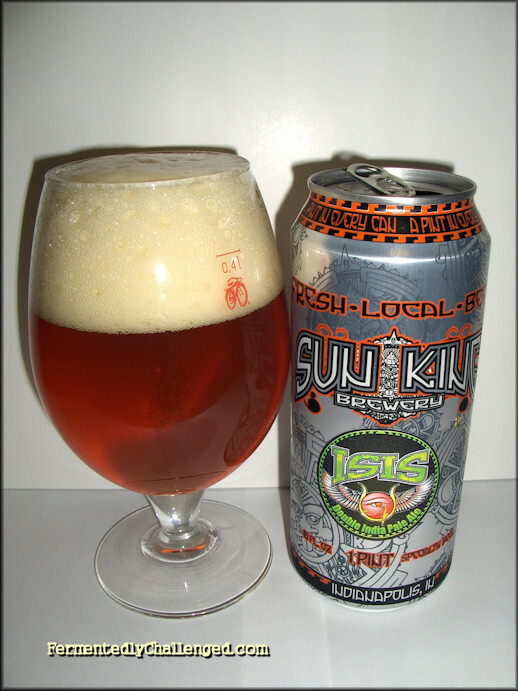 This review is about Sun King Batch 555 Isis Double India Pale Ale. Although the 16oz can that this beer came in doesn't mention Batch 555, I read that every 111th batch of beer Sun King makes they end up brewing up a special big beer. Sun King Isis Double IPA weighed in at a hefty 9.1% ABV and is billed at 91 IBUs. It's based on the recipe for their Osiris Pale Ale but a lot more intense. Most of the beers that Sun King produces are available in 16oz tallboy cans and this beer was one of them. It's described as having "a spicy malt base to help balance the citrus punch from the huge American hop-load". This is a beer I know I'll probably never see anytime soon again in Colorado so I planned on enjoying this can of beer. Appearance: Sun King's Isis poured a nice copper orange color and held a hefty light tan head. The head stuck around a while and clung to the edges of the glass. This beer had good clarity and seemed to be decently carbonated out of the can. Aroma: The star of the review has to have been the aroma. This nose on this Double IPA (DIPA) did indeed have a lot of citrus, but this beer also had a nice spicy hop and malt whiff. It's not quite as tropical as I would have guessed. It's nice to have a spicy tone to a DIPA and not just sweet malt on the back side. I could pick up a slight scent of the alcohol in this brew too, but it didn't distract from the experience. Taste: Isis had a big malty taste complimented by a big blast of hops. The brew was minimally sweet, and quite spicy at that. The hop bitterness was spot on and abundance. Yup, definitely a double IPA on this one. The sweet part started up front and quickly melted into a nice hop mouthful at the end. While bitter, it finished clean without an aftertaste. The entire session felt very smooth. Yes, this was a big ABV beer, so I had to treat it as such and drink this one slower than other IPAs. Overall: I'm going to be heading to the 2012 Beer Bloggers Conference in Indianapolis in July later this year and look forward to touring the Sun King brewery and having more of this beer. I'm a big fan of IPA's and the more powerful double IPAs can always be a special treat. One 16oz can was plenty for me. It was like drinking a couple of regular IPAs in one can. Suggestion: If you don't feel like drinking an entire 16oz serving yourself, it can be a perfect size to share with a friend. I'm glad I have one more can of this beer as I'd like to share this with some friends at an upcoming event. My Bronco hat gets tipped to Sun King Brewing Company for coming up with a solid double IPA in their Batch 555 Isis. Now I can't wait to try their regular Osiris Pale Ale. (Look for a review on that coming soon). Disclosure: This beer was given to me directly by Sun King Brewing as part of a sampler pack for my review. I was not paid for this review. - Sun King Wee Mac Scottish-style Brown Ale review. - Sun King Osiris Pale Ale review. 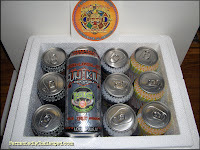 - Sun King Sunlight Cream Ale review.